Make Me A Princess by Nicola Baxter. Review: Have you ever wondered why you see little girls running around in princess costumes on Halloween? Well, the best ones get their stylish look from the book Make Me A Princess by Ticktock. Make Me A Princess will leave little girls everywhere looking pretty as a princess, and it is perfect for the little princess in your life! 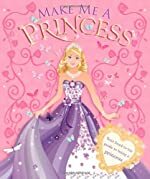 Make Me a Princess is a Do-It-Yourself book with tips on hairstyles, fashion, and many more tips that will leave your little girl as polite and pretty as a real princess. It includes hair treatments, styles for all seasons, and party tips. It even shows your little princess how to throw a party and always look her very best. So let your little girl be polite and pretty. She (and you) will be the envy of the neighborhood! I think Make Me A Princess is a perfect book for princesses of all ages, but some younger readers might need help because the vocabulary is a bit advanced for younger readers. It has every princess tip a girl could ask for, and more! Mothers, Older Sisters, Aunts, and Grandmas, you may even get good fashion choices and advice from this book! Does she need help with manners? No problem! Fashion? Helps with that. Long story short, Make Me A Princess has it all! Little girls will love this book of pink, sparkles, and fashion! It will help your little princess with all her fashion needs. This book is a good book for young girls. I think they will find it interesting because it is about things like fashion, palaces, carriages, and all things princess. It is also helpful for moms because it has easy 5- minute hairstyles for when you are running late. Parents could get great tips and tricks from this book for throwing the perfect princess party. It can also help young girls change their ÒGIMME THAT!Ó to ÒMay I please have that?Ó because it shows little princesses the magic words - please and thank you. In conclusion, this book is perfect for your little princess and you should buy it today! We would like to thank Ticktock Publishing for providing a copy of Make Me A Princess for this review. Have you read Make Me A Princess? How would you rate it?